Nutmeg Hare is in love with COLOR... Tealish Blue is indeed a gorgeous color, so knowing that it is a Valdani pere cotton thread choice makes me happy! Enjoy some relaxing stitching time with the beautiful palette of variegated blue-green shades of "Tealish Blue". Valdani hand overdyed sz. 8 perle cotton balls are 87m. of "lovely". What a perfect additon to any collection of Valdani threads. will be wonderful for Valentine and "I love you" hearts, Spring flowers and so much more! 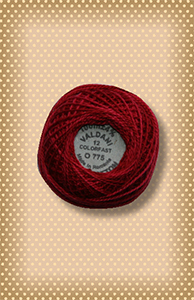 Turkey Red is a vibrant and gorgeous color and when it became a Valdani perle cotton thread color...well...we stitchers hit the "jack (thread) pot". Enjoy needle and thread time with this hand overdyed size 12 perle cotton. It speaks "love", it speaks "Christmas joy", and it also speaks many other stitching languages.... Be inspired and be creative with Valdani's Turkey Red. Fall in love with wool floss as you feel the softness in your hands . 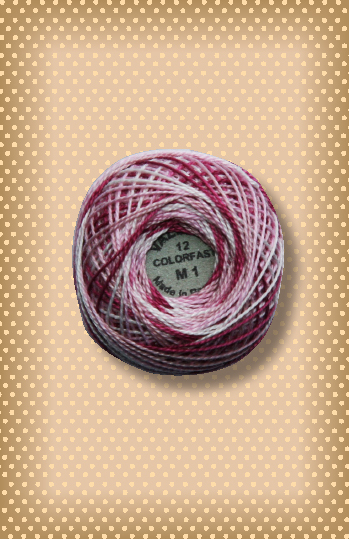 Thread your chenille needle and enjoy some blissful stitching with Valdani's hand dyed and colorfast wool floss made of 100% Australian virgin wool. 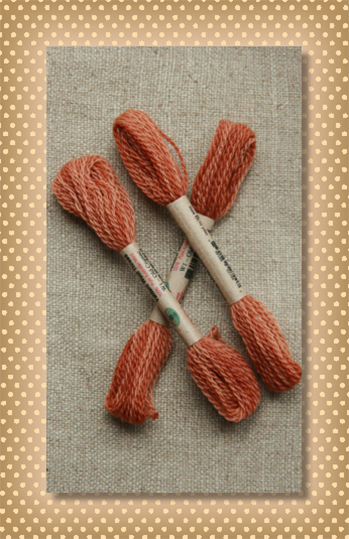 This 8 weight 10 yard skein of rusty orange-brown is wonderful for adding thread variety and detail to your woolen and stitching adventures. 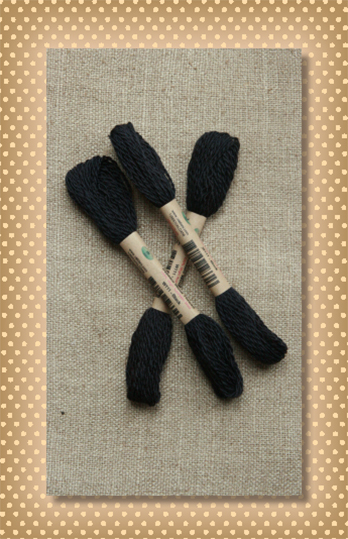 Fall in love with wool floss as you feel the softness in your hands . 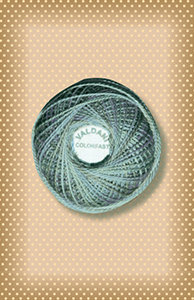 Thread your chenille needle and enjoy some blissful stitching with Valdani's hand dyed and colorfast wool floss made of 100% Australian virgin wool. This 8 weight 10 yard skein of perfect black is wonderful for adding thread variety and detail to your woolen and stitching adventures. 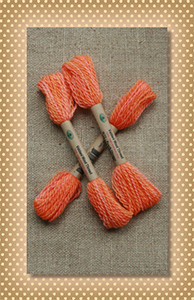 Fall in love with wool floss as you feel the softness in your hands . 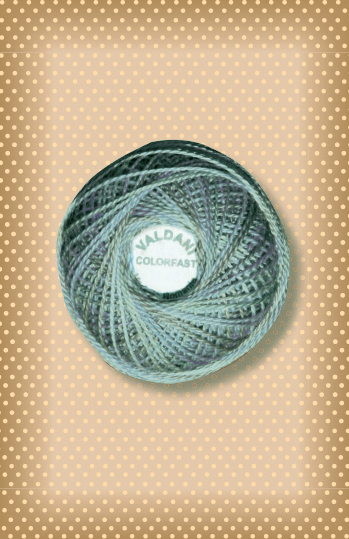 Thread your chenille needle and enjoy some blissful stitching with Valdani's hand dyed and colorfast wool floss made of 100% Australian virgin wool. 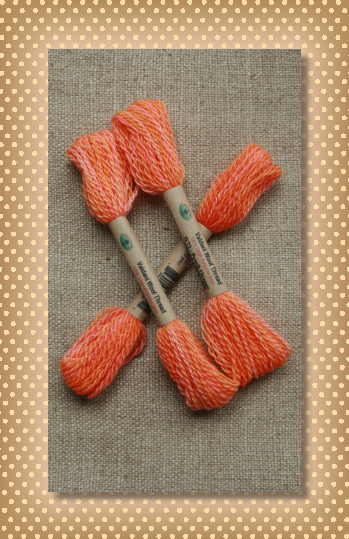 This 8 weight 10 yard skein of spriited orange beauty is wonderful for adding thread variety and detail to your woolen and stitching adventures.